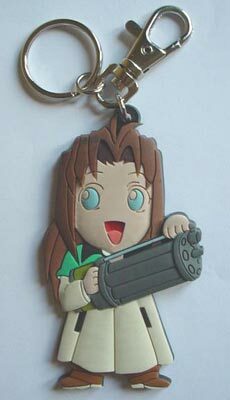 Sporting her trademark mini-gun and with her usual cheery expression, this excellent keychain of the loveable Millie Thompson from Trigun is great for, erm, holding your keys. The fob of Millie is unfortunately plastic and not metal, but it is made from a good quality plastic that is durable and is very colourful. Attached to the fob are a ring for your keys and also a chain for your belt loop, both made from stainless steel. There is little else to say about this product as the picture does pretty much speak for itself at showing what a great, cheerful keychain this is. The only real drawback is that at 3" (7.5cm) the fob is slightly large and can be uncomfortable in your pocket, but that will only really effect any blokes buying it as women will no doubt keep it in their handbags. 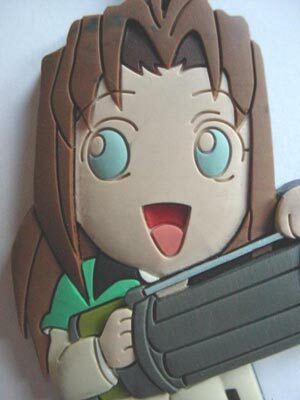 Other then that it does its job of holding keys fine and is a great little item for any anime fan.